It’s Time D-Heads! 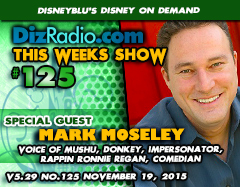 This week Rap a little, get crazy with a Dragon and channel a Donkey as we welcome Comedian, Voice Actor, MARK MOSELEY (Voice of Mushu, Donkey, Rappin Ronnie Regan, Impersonator, Comedian) to the show! Mark is the voice of Mushu from Mulan II, Art of Animation, House of Mouse and more. In addition he also is the voice of Donkey in Shrek materials, was the man behind the 80s classic Rappin Ronnie Regan and more. He will discuss his career, taking over for Eddie Murphy, Impersonations, Comedy and so much more! In addition we have the D-Team back bringing their magic to the show as Erin dips his hands into the virtual mailbag and answers all your questions in I Want to Know. 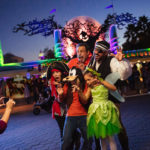 We have Nathan going way back with This Week In Disney History and Paige reliving some magic in the Magical Music Review. And let’s not forget Randy with the latest in Disney Mutli-Media. 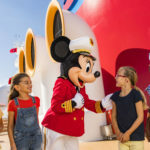 There is news hot off the D-Wire with information on the Walt Disney World, Monorails, Pixar, Captain EO, Epcot, Disney Channel, Descendants, Star Wars, Animal Kingdom, Elephants, Walt Disney’s Birthplace, Mickey Mouse and his Birthday and more!